Was Sandy dead in Grease? That would be a mind blowing revelation after so many years wouldn't it? Grease fans have been sent into a frenzy over a conspiracy theory suggesting Sandy could have been dead all along. A timeless movie that still appeals to every generation. The classic 1978 musical has stood the test of time with new generations gripped by it every decade - but some viewers have wondered whether there was a dark twist to the iconic love story . 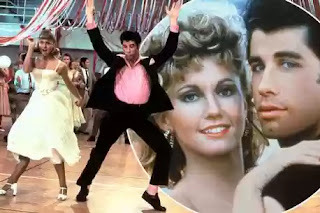 Was Sandy dead in movie musical Grease? Maybe the whole movie just played out in her head. The reason behind this whole death concept comes from the lyrics of a popular song in the movie. The theory goes that the Summer Nights lyric "I saved her life, she nearly drowned" tied into Sandy and Danny's take off in a flying car at the film's climax - and meant she was dead all along. Was this the big clue? The real essence of the movie? Fans have suggested the story actually took place in the character's head during a coma, which certainly gives it a much creepier and intriguing twist. The writer of Grease clears the air. Now, Jim Jacobs - who wrote both the original book and the musical with Warren Casey - has commented on the theory. Nope -Sandy lives, and she was alive all along. Speaking to TMZ, he has shot down the idea and confirmed Sandy was "very much alive". Jacobs added that the real phenomenon surrounding Grease is that it is still just as popular over 40 years later, as millions of new fans emerge every year.